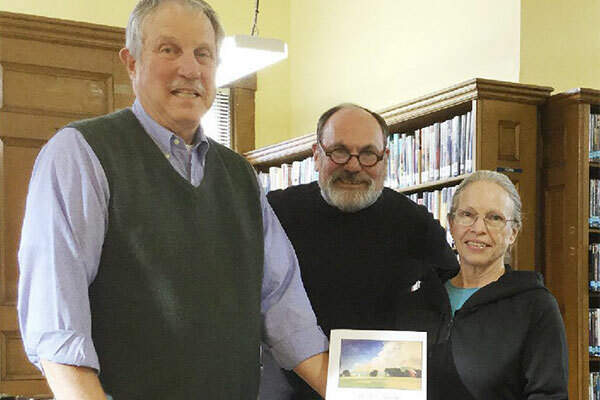 Poetry Nighters Bill Dakin (left), of Chester, and Bill Reed, formerly of Chester, present a copy of the recently published "Poetry Night, Twenty-five Years" to Sharon Tanzer, Whiting Library librarian. The book is a compilation of a quarter-century's worth of poems written by a group of friends for their annual Poetry Night, a pot luck gathering that began in Bill and Lynne Reed's back yard in Grafton, then moved to behind Misty Valley Books, when the Reeds bought the book store. Each year, the Reeds select a one-word theme, and the invitees (over 70 all told), mostly from several southern Vermont towns, but also from farther away, come to the event armed with a poem of their own composition on the subject, which they read from a throne surrounded by torches, sculptures, oriental rugs and, sometimes, hecklers - all in good fun. The book, with biographies of the "poets", an essay about the event by Reed, and color photos of several Poetry Nights, is available to readers at the Library.